Well, maybe not quite a peck but there was quite a bit of peppers from our garden this year and I decided to pickle some of them. This was my first time pickling them and I must say, they came out quite well. So for this recipe, you’ll need a bunch of peppers. I had mostly banana peppers and jalapeno peppers so I washed them and got rid of the ones that had soft spots, black spots or were wilted. What I kept were the ones that were shiny and crisp and fresh looking. I didn’t throw the rejects away, mind you. Save those for seasoning soups or for making salsa. To can peppers, make sure you have your jars ready. Follow the instructions on sterilizing your jars by having them bathe in hot boiling water for a few minutes. I let mine sit in boiling water for about ten minutes while I did other things like washing the peppers and sorting them. When your jars are nice and sanitized, then you can take them out of the hot water and start packing your peppers in them. You might want to wait until they cool off a bit though. They are really hot! Lesson #1: Handle hot jars with tongs or clean cloth. I decided to have some peppers chopped up and ready to eat and some left whole. I decided I will cut up the banana peppers and pickle them in a sweet vinegar and leave the jalapenos whole to be pickled in just plain vinegar. Cut the peppers into rings and discard the stems. Pack the cut peppers into the clean jars. Lesson #2: You might want to invest in some plastic gloves before handling this many peppers. My hands were burning up! Luckily, I remembered to keep them away from my eyes and other parts. Now if you just google ‘how to pickle’ anything, you’ll get a multitude of recipes for your pickling juice. I decided to go the simple route. I decided to make one plain with vinegar only and the rest sweetened vinegar. For the whole jalapenos, which I packed in a large jar, I simply boiled one and one half cup of white vinegar and poured it over the pepper, leaving a one fourth inch headroom. What’s headroom? It’s that small amount of space that you leave unfilled. Meaning, don’t top off your jars, fill it only until a fourth of an inch from the top then put the lid on. Mix all of the above together and bring to a boil. Boil until all the sugar and salts have dissolved into the vinegar. You can taste it at this point and if you think it needs more sugar you can add more. I thought it was fine with two cups. Very carefully pour this mixture over the sliced peppers, don’t forget the headroom, and put the lids on. Now you’re ready to process them. Processing them means you’ve got to put them back in the hot, boiling water bath to kill off any remaining bacteria. I processed mine for another 10 minutes in boiling water. Take them out and let them cool off. And you’re done! 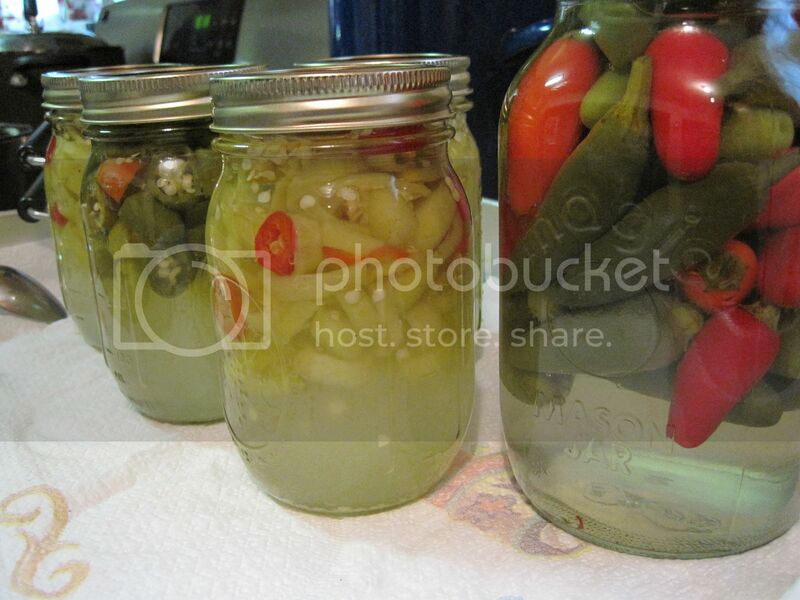 My dad has always pickled peppers and he never did any of the sterilizing and processing. He always claimed that between the spiciness of the peppers and acidity of the vinegar, what can possibly grow there? right? Well his pickled peppers always got eaten up and no one ever complained so I guess there must be some truth to that. Lesson #3 – The sweet banana peppers taste great! But they were a little limp. They didn’t have a lot of crunch to them like I was expecting. Maybe next time I’ll try skipping the final processing time or reducing the time. Lesson #4 – See on the photo how all the peppers were kind of floating in the vinegar? Next time, I won’t be so scared to pack them in tighter. I kind of just dropped them in the jar and when they reached the top I stopped rather than pushing them down and adding more. Next time, I’ll be sure to pack them down.